"As Reuters discovered, it appears that Canada has been taken for a ride by Kinder Morgan..."
A much shorter article can be titled: Everyone who has not outsmarted Trudeau. True enough. But he became government. What does that tell you? How many examples of creating change do I need to provide to change your mind. Change my mind in what regard? It was about your view that non-political action just accomplishes incremental (I think that was your word) change and most change happens at the ballot box. However I am just a bit gobsmacked from your last post. Is your circle of friends that small? Do you really think the people fighting the pipeline can be pidgeon-holed into these groups? Martin how much are you being paid for attacking people on social media? Seriously? You think anyone will pay for countering babble activism? For Canada, this project is necessary This project can be and will be built safely to a new global standard . Most anti- pipeline protesters are law abiding. The radical minority who choose to defy law and order will be thwarted and life will go on. Disinformation across all platforms is what oil companies pay for. Are you trying to telll me that our oil oligarchy does not pay people to spread their message across social media platforms. Any other fairy tales you believe in? But thanks for telling me that you are not paid but instead are merely a very useful idiot. It means I have even less respect for your attitude than when I thought you were merely a capitalist cashing in instread of a idiotic dupe with a self image problem. You know nothing about the people who are stepping up to stop the pipeline. They are not a radical minority and that line is a right wing trope. Kinder Morgan has scored another legal victory after the Federal Court of Appeal rejected a request to consider new evidence from news reports that allegedly showed the Trudeau government rigged its review of the Trans Mountain pipeline expansion project. The ruling was released on Thursday, two days after the federal government confirmed that it would offer $4.5 billion to buy the Texas-based company's Trans Mountain system and take control of its oil pipeline and tanker expansion project between Alberta oil producers and the B.C. west coast. The Federal Court of Appeal has yet to rule on the main case launched by First Nations who allege that the Trudeau government failed in its legal duty to consult them, prior to approving the Trans Mountain project in November 2016. This decision could be released in the coming weeks. Smith, the Tsleil-Waututh lawyer, declined to comment on whether the nation had made a final decision on whether it was prepared to go all the way to the Supreme Court of Canada. He added that if the court sides with the government, the May 31 decision on the motion could become part of the basis for an appeal to the Supreme Court. This could lead to the release of some internal documents related to the Trudeau government's approval of the pipeline. ..the km decision doesn't get finalized for about a month. this from a coaster protector email. We've received an overwhelming stream of media requests, a flood of emails from supporters all over the world, and nearly 12,000 of you sent Trudeau and select Cabinet members more than 300,000 emails objecting to the buyout of this nightmare pipeline and tanker project. It's time to up the ante. On Monday, a National Day of Action Against the Buyout starts at noon at MP offices across Canada. This cross-country action has been put together in record time and we've got more than 65 events already confirmed! RSVP to an event near you and wear red on Monday to symbolize the anger and outrage that people across the country are feeling towards Trudeau's outrageous pipeline buyout scheme. We fought back Kinder Morgan and we drove them back to Texas. This last-ditch attempt to rescue this collapsing project is not the final word. Whoever owns the pipeline, there are still 600 permits to be issuedbefore construction can begin; 17 court cases are due for verdicts any day, any one of which could quash the approval; Protect the Inlet at Kwekwecnewtxw – the Watch House on Burnaby Mountain is getting stronger every day; and nearly everyone in Canada is righteously tee'd off at Justin Trudeau. Welcome to the long, hot summer of 2018 - the summer we take back the power. I haven't RSVPed yet but I plan on attending unless I have a scheduling conflict. Thanks for the compliments. It is plain from the frustration evident in your diatribe that your toolbox is depleted. I am a capitalist but being described as a very useful idiot by an individual of your pedigree is high praise indeed. I suppose I'm a product of my generation but I cannot understand the logic, or more to the point, the lack thereof, of a movement devoted to negative consequences rather than working together to resolve issues to the benefit of all. Trope chucking may be the last resort of an empty toolbox but the tropiest of all is the certainty with which 'activists' focus on a potential spill that has never yet happened and whose potential in future will be mitigated by world class prevention measures. I suppose amongst all the trope examining and evil capitalist denouncing, actuarial deductions are considered redundant to saving the planet when hysterical hyperbole is readily at hand. None the less, opponents of progress are being convinced that this project is positive for Canada as their particular grievance is addressed. The pro- pipeline majority is also rousing itself as the excesses of 'activists' manifests itself into the public consciousness. The pro- pipeline majority is also rousing itself as the excesses of 'activists' manifests itself into the public consciousness. "Adam Scott of Oil Change International says Trudeau's TransMountain acquisition makes no economic or environmental sense, it is 'incredibly stupid." Join a snap action outside your MPs office, Monday, June 4th! Tell others! It is not surprising that the National Observer notes that “By the time the expansion is built, the price tag for nationalizing the existing assets and building the expansion will cost Canadians upwards of $15 – $20 billion.” That is a huge amount of tax-payer’s money to risk on a pipeline that many people believe is not viable anyway. That is an amazing admission from Trudeau. He just spent upwards of $20 billion on a risky project. “Trans Mountain’s expansion was never commercially viable and Kinder Morgan knew it”, argues the National Observer. No wonder his Government was ridiculed in the House of Commons. Speaking on May 30th, NDP MP, Nathan Cullen said: “Only Liberals would try to force through a pipeline and tankers through traditional First Nations territory and call that reconciliation. And only this prime minister would call himself a climate change leader and then be willing to spend $15 billion on a diluted bitumen pipeline to China”. Thanks fo your response Martin N. Nice combinbation of idle speculation on other peoples views and rather weak insults. As ususal though you don't include a single fact. Climate change is a game of keyboard warrior to you. To many of us it is a struggle to save some future for our grandchildren. That while you do need a license to go fishing, any idiot can vote for free. I didn't want to be accused of 'attacking' again, quite so soon. I have my reputation to consider. I must, however take mild issue with your hogging the moral pinnacle with such tenacity- for the sake of the grandchilden of course. You leave little room for other saviours of the planet, if not saviours of peoplekind. Tempting the faithful with facts is akin to beating one's head against a brick wall - it feels so good when you stop! Although you are entitled to your own opinions, there is no persuading the faithful that facts are not owned by those whose moral superiority gives them license to only accept as fact, those that meet their high moral standards. Deniers, and other assorted climate heathens, why even socialists lacking fervour are not allowed facts. To some of us, actually reducing carbon use takes precedence over jetting about the planet, lecturing and hectoring others or badgering peoplekind with doom and gloom. Silly capitalist that I am, I believe there are more solutions available than stunting Canada's economy while the rest of peoplekind carry on with their selfish hydrocarbon consumption. Even emerging economies are refusing the admonishments of those on the moral pinnacle with you and refusing to give up not only cooking and heating but the advantages that the use of hydrocarbon fuel powered machinery has done to increase harvests. Because the 'risk' is political, not economic? If protesters obey the law, there is no risk that private enterprise cannot mitigate. Do you support the expansion of Trans Mountain – Kinder Morgan pipeline construction through Lower Mainland of British Columbia to Port of Vancouver to export Alberta crude oil to China? Overall, following best efforts to adjust for population size and gender through Vancouver City ridings, Burnaby ridings, Tri City ridings & Surrey ridings (“the ridings”), BC NDP is @ (48%) approval, BC Liberals (35%) and BC Green (17%). (51%) of these respondents has confidence in BC’s Economy, while (39%) do not. (52%) of BC Green supporters have confidence in the BC Economy. (54%) believe in climate change, while (39%) do not. (34%) support construction expansion of controversial Trans Mountain Kinder Morgan pipeline through the most populous regions reaching upwards >1,500,000. The population through these ridings is more progressive in deduced party support (or the so called middle of the political spectrum is more left progressive). The party expected to be most in favor of the pipeline, the BC Liberals, supports it to (72%), while BC Greens, growing in support in the region do not, well over (9/10). BC Greens have slightly more confidence in BC’s Economy than average > (50%). Nearly (6/10) of these respondents believe in climate change. It is difficult to imagine ever winning public minds and hearts through this particular region for expansion of a pipeline carrying Alberta crude oil, particularly acting the bully. (51%) of respondents are willing to believe oil and gas prices are manipulated, with (16%) claiming no impact, meaning (51/84) or (61%) of respondents vouch that manipulation in the market occurs in oil and gas. This percentage is a damnation of the pipeline project from a clear majority of residents, because they are annoyed and more willing to permit some elasticity in their reasoning. I believe this RSR ROBBINS poll does two things. First, it provides reinforcement and clarity to the ‘not in my backyard’ rationale possessed by a large pool of voters already predisposed to progressive thinking, and reflects a trend among the majority of this urban population to be even more progressive as this concerns the environment, particularly the clear rejection of the Kinder Morgan Trans Mountain pipeline project, now generally looked down upon. (To wit: A noteworthy strain of BC Green supporters are not environmental activists by any stretch). It tells me that B.C. respondents in this core urban region are more like those in Portland Oregon than Calgary or even Edmonton Alberta. It tells me that the real statement British Columbians are making is that it is Alberta which is the dependent on crude oil for its economy, while BC is not. It tells me that British Columbians value their region as a world class destination for beauty and even the thought of any issue involving oil and gas the province its own coastline or that of Washington State, Oregon, or California-is enough to turn them off the pipeline. A person thinking reasonably can see how an urban centered pipeline has public relations nightmare possibilities – on a world stage watching environmental matters internationally relative to Paris and relative to U.S. President Trump. Nearly (6/10) of these respondents believe in climate change. Actually, 54%, according to the numbers at the link. Which, if I'm reading this correctly, means that more BCers oppose Kinder Morgan than believe in climate-change. That's possible, I suppose, though I'm trying to imagine the kind of voter who is so hostile to environmentalism that he thinks the scientists are all lying about global-warming, but is really concerned about protecting nature from crude oil. Alberta's premier may have taken the bully route because she sees an election coming in her province, but the hysterical nature underlying this aggression is not received well in BC's largest urban area. "Bully route" and "hysterical" are not terms I would expect from an objective researcher. ..another from same pollester. method looks pretty good to me. Do you support Prime Minister Justin Trudeau’s and National Energy & Oil Board out of Calgary Alberta’s (DECISION) -- to permit Kinder Morgan of Texas U.S.A. to greatly expand its oil pipeline capacity through the Lower Mainland of BC – in order to ship crude oil from Alberta to Vancouver Coastal Waters and overseas to China for sale to that country? Method: A digit dialing telephone sample of 1,440 British Columbians conducted January 19, 2018 until January 24, 2018 who say they voted in the May 2017 BC General Election. Best Efforts were made and adjustments occurred thereafter to reflect regions of the Province of British Columbia including: Vancouver Island, Lower Mainland of British Columbia (Greater Vancouver ++), the fabulous Interior of BC, the North and the Kootenay region. Margin of Error produced from voter totals - not eligible or registered, and declared at (3%) neither way, (4%) on the smaller size BC Liberal question. ..and another from the whole province. the no is rising. Do you support the large expansion of pipeline by Trans Mountain & Kinder Morgan through Greater Vancouver and Vancouver Ports? Kinder Morgan Trans Mountain large pipeline expansion is a non starter in Vancouver - a full on failure. Support for this pipeline was always known to be low on Vancouver Island, Vancouver and Burnaby City and city suburbs along Highway 1 where the pipeline route expansion is set to occur, covering and inclusive of Vancouver Island nearly one half of the provincial population. The areas and regions of the province more supportive of the pipeline are in the Fraser Valley - Richmond, in the North and to some extent in the Interior. Would you support a one year moratorium on Foreign Investment in BC residential housing, which moratorium will specifically prohibit the sale of any residential property under one acre size, including attached dwellings like Townhouses and Condominiums anywhere in British Columbia, your decision to be founded on the basis, that this action is required out of an abundance of caution to help sort BC뭩 Residential Real Estate Difficulties, including acknowledged reports that 5-10% of BC homes are owned by foreign investors, and given the concentration of ownership in certain cities likely equals one in 5 to 1 in 3. So, in the question itself, they're stating the arguments for the policy, without also providing the arguments against? ..there are zero unbiased and objective pollsters imo. that does not mean that what i have posted re: the pipelines isn't true. I thought so at first, but it isn't that biased. It mainly cites facts that suggest there is a problem. Then mentions a potential solution while describing it as being taken "in an abundance of caution". So the question doesn't suggest there is any urgency or even a direct causal link. Aren't pollsters paid to ask certain questions? I do like to see the actual questions, and even the order they are asked in but even if one or two questions are biased to me that doesn't negate the usefulness of the others. In this case it seems the questions are intended to measure support for progressive action. I take all polls with a grain of salt. Particularly when they are close or internet based. These numbers on the pipeline are not marginal. They are definitive even with a widened margin of error. I'm surprised there is so much support for the pipeline. I expected the opposition to be stronger. Come on NR. Robbins SCE Research isn`t a polling company. AT ALL! He`s a guy here in BC who has been debunked as a complete fraud. He reads other companies` opinion polls, from his kitchen table, and then magically conjures up what he thinks. Complete joke. Psychopath more like it. I still recall a thread where Robbins threatened people here on Babble with physical violence for mocking him back circa 2004. Thread no longer archived. Guy is an absolute flake and nutnar. Glen P. Robbins’ SCE research features a crack team consisting of…well, Glen all by his lonesome. After mysteriously jettisoning his run for the leadership of the BC Reform Party just after Christmas, Glen started churing out “poll” after “poll” that vented at whatever he happened to be ranting at that day. Glen fabricates figures that would require a small fortune to staff hundreds of professional callers in a state-of-the-art call centre, rather than his home’s single-line kitchen counter phone. With the two notable exceptions of perpetual B.C. Liberal hopeful Sandy McCormick and B.C. Liberal/NDP hopeful Port Moody mayor Joe Trasolini — both who actually PAID Glen for his self-proclaimed professional services, nobody takes this guy seriously. In fact the last time someone checked, 19 out of 20 people polled don’t believe Glen could tell the difference between a statistical standard deviation and a VW Beetle standard transmission. Mild entertainment? Sure. Credible polling? Vroom, vroom! I will concede without following the link. I hate when I get suckered like that. While his poll may be a dud I still think he is pretty close on pipeline sentiment. It does look like Crazy Glen has a new admirer though. Vroom, vroom. Congratulations to the Texas oil company formed from the ashes of Enron, you really played us like a fiddle. A decision is expected in one of the court cases facing the pipeline in the next couple months. Unlike the B.C. government’s case, the Indigenous case that consultation was insufficient is considered a strong one. If that decision goes against the government, or if it doesn’t but goes against the government on appeal to the Supreme Court, the pipeline is dead. And with it somewhere between $4.5 and $12 billion of our tax dollars. Kinder Morgan knew this. Why did our government ignore it? Even if the courts rule in the government’s favour at every step, the Indigenous-led resistance on the ground in B.C. will intensify, and every foot of pipe will be a battle. There will be arrests, people chained to everything in sight, and the cost of building the pipeline will spiral out of control. Meanwhile, Indigenous groups across the country have committed to engage in civil disobedience against the pipeline in their own territories. Most importantly, all indications are that by the time the pipeline is built, the market for the product it transports may not be there. Certainly not at prices that make the investment worthwhile, with experts now forecasting that $50 a barrel oil is more likely than a return to $100 a barrel. Want more bad news? I got you covered. “The United Nations International Maritime Organization (IMO) recently approved new, much stiffer fuel standards for the 50,000 ocean-going vessels which currently burn low-grade, high-sulphur oil.” The new rules, in place by 2020, require no more than 0.5 per cent sulphur, a 700 per cent reduction from the current average. What does that mean for Alberta’s oil? "Exactly which Asian countries or refiners have signed long-term contracts to purchase more Alberta bitumen for decades to come?" asks journalist Paul McKay in the Energy Mix. "Exactly how much have they committed to pay per barrel delivered?" The NEB didn't ask, and the answer is no one knows. I do like to see the actual questions, and even the order they are asked in but even if one or two questions are biased to me that doesn't negate the usefulness of the others. Is the question that VOtD posted one of the biased ones? Or one of "the others"? The thought of the Liberal's buying TransMountain and building a pipeline makes me all nostalgic. Northeast coal was one of Canada’s last megaprojects – an economic policy in vogue until the early 1980’s that involved governments partnering with big business to bolster strategically important industries and economically underdeveloped regions. Worried about energy-price hikes and supply uncertainty in the 1970’s, Japan’s steel industry wanted new, stable sources of metallurgical coal. Social Credit Premier Bill Bennett saw a chance to open up part of northeastern British Columbia to economic development. The province funded construction of a $400 million, 300 kilometre rail line linking the mines to CN Rail’s main line to Prince Rupert. It also built access roads, hydro connections and services for the all-new town of Tumbler Ridge, about 60 km west of the Alberta border. The federal government helped build the coal terminal at Prince Rupert. The total bill to taxpayers came to about $1.6 billion. Development of the two mines added up to another $1.5 billion in private investment. The overall investment was to be guaranteed by 15-year supply contracts with the mines’ Japanese customers at well above the market price. But before the first Japanese ore freighter even loaded its first shipment at the Ridley Island terminal in January 1984, the steelmakers began demanding cuts in volume and price. The predicted non-stop rise in oil, gas and coal prices never happened. Japan’s steelmakers faced new competition from mills in places like India and South Korea, which had access to cheaper coal sources. The Japanese never threatened to walk away from their commitments. But a series of arbitrations began pushing down the price from the original contract price of $98 CDN a tonne, about 40 per cent above prevailing world prices. A deal signed in 1997 extending the long-term contract until March 31, 2003 keyed northeast coal to prices from southeastern B.C. and Australian mines. Contract volumes, too, have ratcheted down. The reduction forced BC Rail and CN Rail to cut freight rates for the 100-car coal trains and Ridley Island terminal to reduce its handling fees. BC Rail spokesman Alan Dever says the Crown-owned railway has never recovered its investment in the line. Careful not to throw out the baby with the bathwater. Government investment in mega projects, certainly in rail transport, is a good thing. We want the government to invest in and support green infrastructure. The people of Quebec owning Hydro Quebec has been of enormous benefit to us. Government support or promotion of specific industries is not a bad thing in and of itself. I guess that investment in your new polling buddy, Glen P Rollins, is down the tube huh, epaulo? No apologies, no shame, just continue on spamming the site with a new BFF like nothing happened. I think you are getting desperate to counter rising support for getting resources to market. Well, maybe not rising support but rather existing support making itself heard. Nice try with Crazy Glen, though. 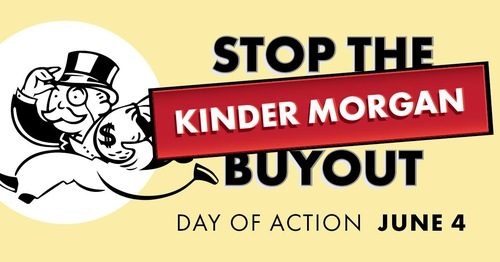 "Join the National Day of Action to Stop the Kinder Morgan buyout on June 4th. Only a huge public outcry can stop this outrageous buyout before its finalized..."
Look no further than Sweden for a little country that could. Sweden has many industries manufacturing high tech products. What does Canada invent and manufacture to sell globally? Maple syrup? The second reincarnation of NE coal hasn't worked out much better than the first one. Government should invest in the infrastructure and policies that allow high tech to thrive rather than attempting to pick up the pieces when they don't. Canada depends on resource exports because we are too timid the assume risk. We live in thrall to the big nation next door. Sweden, otoh, has designed and built cars, trucks, ships and aircraft, all uniquely Swedish. In forestry, Canada creates only a couple of jobs per cubic meter of production while Sweden creates 17. Sweden has IKEA while Canada has 2X4s. Not to be picayune, but it's not Kinder Morgan rather it is Kinder Morgan Canada that is the legal entity in question. The funds from the purchase go to KM Canada, in Calgary, not to KM in Texas. Thanks for the clarification. Martin N.
KM Canada has about 103,000,000 shares out, so they could pay a $35 extraordinary dividend! ..no one has produced any evidence that shows these polls as fake. to me these polls fit the struggle. fit the millions raised to fund indigenous court cases over the years. fit to understand why kennedy stewart has recently said that polls showing 12% of bc'ers are willing to be arrested. fit to understand why the mayors around the lower mainland have come out against. same goes for the coastal communities including van island. this would not happen if their populations didn't feel that km ending in bby/van was wrong. that it wasn't endangering the whole of the west coast. trying to minimize this support is a standard tactic used by big oil and govs. ..but here we are today. km has been driven from the scene. the feds and alta positions all come down to indigenous court cases. few places in the world has resistance taken on such powerful forces and stood on the edge of victory. If a Referendum were held in the Province of British Columbia to determine the fate of Alberta oil transported to coastline which of the response choices BEST reflects your personal opinion of what direction leaders should take moving forward? Should British Columbia engage/invite its friends in Washington State government similarly affected by the Trans Mountain Kinder Morgan pipeline in any legal applications to either U.S. or Canadian court? 1.302 Random Respondents (say they are provincial-federal voters 2017 & 2015) contacted predominantly by digit dialing, throughout all parts of British Columbia ‘somewhat familiar’ with news about pipeline issues, most particularly the political battle between and among Province of British Columbia on one side and Province of Alberta and Canada on the other. Margin of Error presented as (2.5%) plus or minus in the usual way 95/100. In BC, the New Democrat/Green Alliance is doing very well increasing support from 2017 Provincial Election vote by (11%). The so called centre right coalition of BC Liberals et al is down (20%), since the election, with BC Liberals engaged in leadership contest during the period and BC Conservatives historically more a distraction than a serious contender for votes and power. In context of the commercial aspect of the pipeline issue, the federal coalition can be seen predominantly as (federal) Liberal or (federal) Conservative. Since the 2015 federal election the numbers for the coalition are down over (20%) due to Liberal support dwindling, and Green support increasing as former Trudeau supporters join Greens. The Leap Manifesto has actually materialized in British Columbia on the basis of solid average New Democrat and Green support & – thanks in (noteworthy) part to the Kinder Morgan Trans Mountain pipeline issue. Question 3 really euthanizes Kinder Morgan, Conservatives, New Democrats even BC Greens are willing to flock to support for a northern pipeline. John Horgan and BC New Democrats have much more support than Justin Trudeau and federal Liberals & the average of BC Alliance support is equal to or better than average of commercial coalitions imagined. Question 4 also bodes well for ‘International’ support with Washington State (“Comity”) as British Columbians particularly those residing in Lower Mainland (Vancouver) and Vancouver Island appear more supportive of our American friends than Alberta. Nicely said but how does the answer then become shipping unrefined bitumen to China. Your logic seems to be unhinged from the facts. But then most climate change deniers have extreme logic problems trying to square the circle of their justifications for the absurd. Socializing risk, privatizing profit and trashing Indigenous rights. What could possibly go wrong? He can support both. Take allies where we find them. We don't have to agree with him on pipelines to acknowledge he is right about Sweden and about Canada's failure to add value to our resources including an educated workforce. There are anti-abortion anti-pipeline people. Can't afford to turn them away because we don't agree on women's rights. I'm not saying accept his views on pipelines, but I don't think he is actually evil and wants climate change to worsen and whales to die. He believes it can be done safely and that there is a market and that as long as people are going to burn oil it might as well be Alberta's. I don't agree with that argument at all but some people do. Kinder Morgan injunction expanded across B.C. A B.C. Supreme Court judge has granted Texas energy giant Kinder Morgan the power to expand the scope of its injunction across the province, in a bid to keep anti-pipeline protesters away from its property. Lawyers for Kinder Morgan asked the judge to broaden its March 15 injunction against protesters during a hearing on Friday. The existing injunction imposes a five-meter exclusion zone around its Burnaby Mountain tank farm and Westridge Marine Terminal. B.C. Supreme Court Justice Kenneth Affleck agreed to the lawyers' request to make the injunction applicable to other locations and equipment facilities, and also removed the 10-minute warning period given to protesters before police start making arrests. Under the previous injunction, protesters were given 10 minutes after the RCMP read the injunction aloud to them, giving them time to decide if they wish to leave the injunction zone or be arrested. Killoran suggested instead that the 10 minutes be replaced with "a brief opportunity," giving protesters only a moment to decide after the police arrive and read the injunction. Killoran cited a RCMP constable who said that protesters are "taking advantage" of the 10-minute warning by using "waves of persons" blocking the gate, resulting in "only a fraction" of protesters violating the injunction actually being arrested. The strategy, she said, was conducted by organizers leading the activist movement. She cited two affidavits by private investigators who were hired to mingle among the protesters and receive training before the protest action. The two investigators took notes and photos, chronicling how organizers gave protesters information about the injunction and advice on how to avoid or risk arrest. To expedite the process, Affleck agreed to allow the injunction to be read over an amplification system, so that all protesters in the vicinity, including those not yet breaking the injunction, would be warned of the consequences of doing so and are therefore immediately eligible for arrest upon crossing the injunction line. There was another huge demonstration in Burnaby today, this time involving hundreds of people, against the $7.4-billion Kinder Morgan pipeline project. But this one was different than many others in that the main target wasn't the Texas-based energy company—it was Justin Trudeau. That's because this week, the Trudeau government announced that it is buying Kinder Morgan's Trans Mountain pipeline system for $4.5 billion. The deal will close in August. On Monday (June 4) there will be more than 75 events at MPs' offices to protest Trudeau's pipeline bailout. No, My view encompasses much more than refuting the simplistic and narrow focus of the anti-pipeline agenda. If one were to assign a value to all the questions asked in ecological polls independent of a specific cumulative result, one could interpret my responses as being anti-pipeline, pro marine protection. The sad fact is that lies, damned lies and statistics work both ways. The clever melding of different objectives into a whole cloth of seamless opposition to TM will not stand. The anti-pipeline agenda seizes on a potential marine bitumen spill only as a convenient shock trope to energize enthusiasm for their political agenda in much the same way they co-opt indigenous issues as support for their political agenda -" for the sake of the grandchildren " is is a disingenuous rallying cry that has nothing to do with the safety of our marine environment and everything to do with guilt-tripping vulnerable but naive and ill-informed dupes. If protecting our marine environment is the agenda, why is there no focus on the debilitating effects of plastics in the oceans on our revered sea animals and shellfish? Whales and fish choking on fishnets and six pack rings, swallowing plastic bags, bivalves with high levels of plastic in them, floating islands of plastic trash, hurricane debris etc. Not a peep from those on the pinnacle of moral superiority. No mention, much less action from virtue-signaling but no less venal politicians. If compromise is possible, I will stand among the protesters but, considering the impossible absolutism of the protest movement, led by the nose by professional grievancemongers, I am forced to side with those willing to accept the need for positive change. Why don't you put up an alternate theory regarding how the planet can exist without oil in this decade, not the next century? Also, perhaps you can provide an opinion how we can fund a caring society that leaves no one behind without exporting our natural resources bearing in mind that taxing and borrowing are both simply changing pockets with the money. Your opinion on how running up a trillion dollar cumulative public debt is beneficial 'for the grandchildren' will also be helpful. I am not a climate change denier, I'm a climate change realist. I advocate for personal responsibility in managing one's carbon footprint and installing renewables to mitigate it. As merely a humble rustic, I leave saving the planet to those ensconced on the pinnacle of moral superiority and content myself with positive contributions, however small. The polling was conducted in March, before Finance Minister Bill Morneau announced the country’s latest, greatest fossil subsidy last week—C$4.5 billion to buy out the Kinder Morgan pipeline, amid estimates of $15 to $20 billion to actually finish the project. Two-thirds of Canadians disagree with oil and gas subsidies, and 41% strongly disagree. The majority still oppose subsidies if they think public money given to fossil companies will create jobs and economic growth. Only three in 10 respondents think an end to fossil subsidies would hurt the economy. An overwhelming 96% agree that governments should disclose the amount fossils receive in subsidies. The majority of respondents cited the need for more ambitious climate action as the reason to end fossil subsidies, while 21% wanted to see the money freed up for other priorities like health care, education, and housing. "Canada does not own our Secwepemc Territory. My lands are unceded, we will never surrender or cede our lands. We will remain UNCEDED and we will face off with KM & Canada and defend our Secwepemc Territory by any means necessary..."
"Under the constitutional common law and the Indian part of the Royal Proclamation of 1763 the Indians retain two things from the pre-contact epoch. These are their possession of, and their self government on their land. These preclude non-native court jurisdiction upon unceded territory..."
Anyone arrested for 'disobeying' a BC court injunction precluding 'interference' with TransMountain, should first and foremost advise the court that as a matter of settled and binding law, Canadian courts are without lawful jurisdiction upon unceded territory and furthermore any exercise of jurisdiction will necessarily entail the commission of crimes of constitutional treason, fraud and arguably genocide. They should 'adopt' , file and submit the article to the colonial court as their sole defence. Do not trust a lawyer to do this as they are themselves officers of the illegal crown courts sworn to uphold an illegal and illegitimate Canadian colonialism and cannot be trusted to do anything but attorn you to the fraudulent jurisdiction of the illegal and usurping court system. The only 'rights' BC, Canada or Kinder Morgan have on unceded Secwepemc territory, are to remove themselves forthwith. That is what the law actually says and the truest, strongest basis upon which to resist the corporate Canadian invasion by the pipeline upon Indigeneous lands.